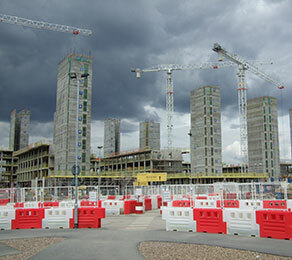 The development included 11 residential blocks, each made up of five to seven buildings, where thousands of athletes and officials stayed during the London 2012 Games. As well as accommodation, it comprised shops, restaurants, medical, media and leisure facilities. Immediately after the Olympic Games, the village became part of Stratford City’s overall regeneration scheme, which would include a new regional shopping centre with additional leisure, office and residential areas. CCL supplied and installed its flat-slab bonded post-tensioning system for three of the residential plots, one plot for Knight Build and a further two plots for P.J. Carey. The CCL flat-slab bonded system is designed to meet British and European standards for post-tensioning materials and testing, and is also CARES approved. CCL was awarded the projects because of its operational experience, technical knowledge, competitive price and pragmatic approach. The development objective was to achieve a flat soffit within the tight floor-to-floor heights whilst maintaining a minimal slab depth. The use of post-tensioned slabs allowed the structure to achieve the reduced slab thicknesses. CCL delivered numerous presentations to all parties involved (Building Control, Bovis Lend Lease, Robert Bird & Partners, P.J. Careys, Knight Build etc. ), including an operational workshop that explained the installation and on-site coordination process for construction managers.